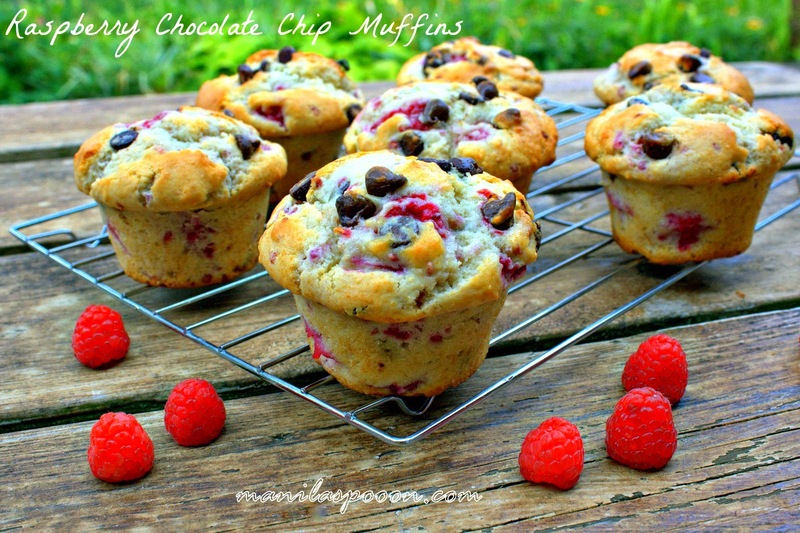 Fresh raspberries provide a sweet-tangy contrast to chocolate in these more-ish, moist and totally scrumptious muffins! 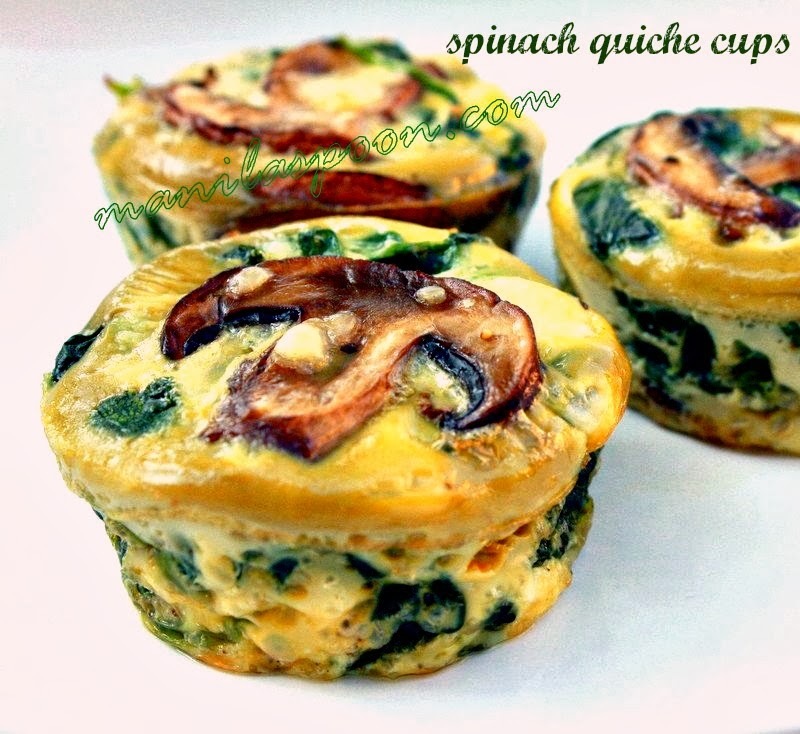 Great for breakfast or anytime you feel like snacking. *You can replace half of the flour with 1 cup oatmeal for extra fiber, if you prefer. Preheat the oven to 375F. Line a muffin tin with paper cups. Melt the butter with the brown sugar in low heat. Combine the flour, baking soda, baking powder and salt in a small bowl. Beat (or whisk) the eggs with the sour cream until combined. Add the Vanilla extract. Beat the sugar-butter mixture into the sour cream mixture. 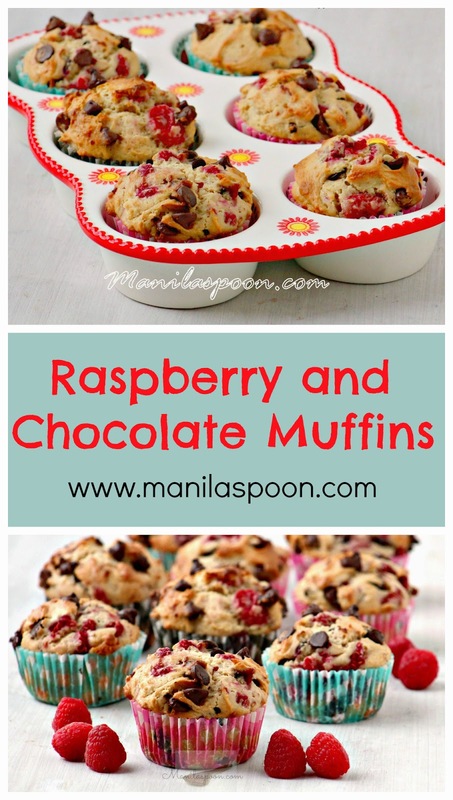 Fold in the flour mixture and then the raspberries and chocolate chips. Fill the muffin cups with the mixture dividing the batter equally. Sprinkle generously with sugar (if using). Bake in the preheated oven for about 25-28 minutes or until a tester comes out clean. Cool in the muffin tin for about 5 minutes. Transfer to a wire rack to cool completely. Enjoy! If you wish to print the recipe, there’s a print-friendly icon above the post. Click on the image box and tick the remove image box for easy and convenient printing. I am such a huge muffin fan, too! Yum!! Who doesn't love a great muffin!? Raspberry and chocolate truly are a match made in heaven. Thanks for sharing this recipe – I will be trying it soon that is for sure! These are SOOOOOOO good! Thanks for sharing the recipe. I made some this morning, and they are now officially on my "favorites" list! hi there.. just wondering, and if i missed it sorry, how many does this make? Depending on the size of your muffin tins, at least 12. Please enjoy!